Holland America Sweepstakes: Choose your cruise and you could win it! 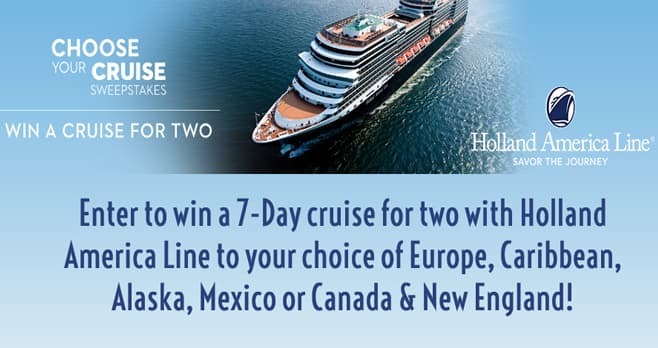 Enter now for your chance to win a 7-Day cruise for two with Holland America Line to your choice of Europe, Caribbean, Alaska, Mexico or Canada & New England. The Holland America Line 7-Day Choose Your Cruise Sweepstakes is open only to legal residents of the fifty United States, the District of Columbia and Canada (excluding Quebec) who are 21 years of age or older as of the date of entry. The Sweepstakes begins at 12:00 A.M. PT on April 01, 2019 and ends at 11:59 P.M. PT on March 31, 2020. There is a limit of one sweepstakes entry per person and per e-mail address, regardless of method of entry. The grand prize consists of one (1) seven- (7-) day Holland America Line Cruise for the winner and one (1) guest, sharing accommodations of one (1) ocean-view stateroom. Visit www.enterhal.com to enter and see Official Rules for details.